I knew I shouldn’t have eaten that delicious chicken salad from a cafeteria that I didn’t see come straight out of the refrigerator. I knew my stomach is a big sissy and can’t handle what most people have no problem with. I KNEW BETTER. But I did it anyway. I’ve not felt that bad since I had to stay the night in the hospital from food poisoning way back in 2004….So my best guess is that’s what it was. Either way it was bad stuff. So bad. Since this morning I wasn’t in any state to effectively parent our wild girls Lynn had to figure out something. It was 20 degrees here bright and early, too cold for little girls to be outside for long periods of time. So Lynn took the girls to his parents house, wished them (his parents) luck, and left to go feed cattle. Thankfully the girls (even Claire) remember they have manners when (and only when) I am not around. They watched cartoons, read books and made cookies. 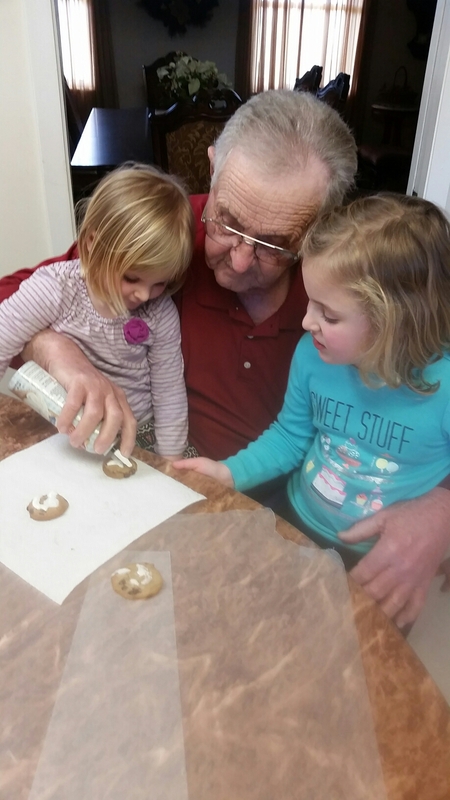 I received this photo from my mother-in-law, it is my father-in-law holding both girls and doing something he has never, ever done before. In their happy place. Photo credit to Roselyn Waters. The man has never before today made and decorated cookies. He has done a lot of things in his life…But somehow cookie baking wasn’t included on that list. Apparently when Memaw asked them if they wanted to engage in a little baking, Caroline and Claire wheedled and blinked their big baby eyes at Papaw, and used all their charm. When employed, their charm is almost completely irresistible. Like the siren call of a mermaid to a sailor…Or the box of “Chips Ahoy with Oreo frosting middles” to me at the grocery store, it’s something that can’t easily be ignored. (Seriously. I can eat an entire box of those cookies by myself. I may have even hid from the children before so I didnt have to share those bites of deliciousness … though not today) These kids are smart. They know how to work together when need be. At any rate, they all made a beautiful new memory today. And I lost 10 whole pounds overnight. I’ve never had a diet that worked that fast and efficiently. So maybe good things happen even from a terrible night of sickness. Whew. Enjoy your weekend friends.